Cheesy Lasagna recipe by Saima Khalid at DesiRecipes.com. 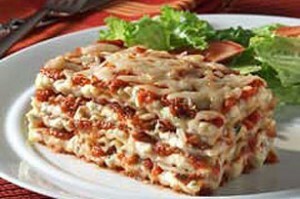 Delicious lasagna made with ricotta, parmesan and mozzarella cheese. Boil lasagna sheets according to package. In separate vessel boil keema with ginger , garlic until water evaporates add spaghetti sauce and heat. In separate bowl beat eggs, sour cream, ricotta cheese and add salt and pepper to taste take a rectangle baking dish preferably pyrex or corning. Start layering first lasagna then half of keema then sheets then whole sour cream mixture then another layer or keema finally cover with sheets and sprinkle mozzarella cover with aluminum foil and bake on 350 till the sour cream sets approximately 40 min. you know it coulkd help if you weere more precise!!!!!!!!!!!!!! !